Customize the template content for report in the InLoox PM report designer that is available in the InLoox PM options. Please note that this chapter describes only the first steps for the report designer. The complete help document you will find in the InLoox PM Report Designer dialog box. In the Reports area choose one template, e.g. Time tracking, from the list, which you want to change, and click Design. The following gives an example of how to add an additional data column to the Time tracking report in the InLoox PM Report Designer dialog box. In the InLoox PM Report Designer dialog box click Report Structure. 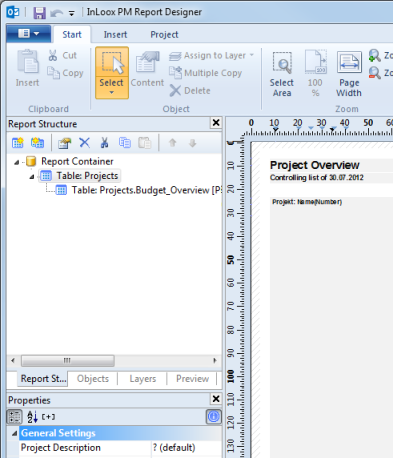 In the Report Structure area above double-click Table: Projects.Time Tracking. In the Table Contents dialog box, in the Data Line tab choose one line and click . In the Edit Table dialog box, in the Data and Functions tab, in the tree structure click Fields, then Projects and afterwards Time Tracking. Under Time Tracking choose the ChangedBy field, and click Insert and then OK. The added field is displayed in the right side of the Table Contents dialog box in the (Contents) field. In the Edit Table dialog box, in the Header Line tab, click and choose Text from the drop-down list. In the Edit Table dialog box, in the Data and Functions tab enter into the lower text field the text (including quotation marks): "Changed by". In the InLoox PM Report Designer dialog box click File and then Save. Click again File and then Close. Click OK or Apply to save the changes in the InLoox System. How to create a custom project report | InLoox PM 8 • Copyright 1999-2019 © InLoox, Inc. All rights reserved.